If you Google “Texas tourist attractions” you will discover advertisements for major cities, theme parks, outlet malls and more. However, the tourism tides are changing, and your common tourist attraction has new competition called agritourism. While they may not feature roller coasters, the fully loaded you-pick farms of Texoma, Bailey’s Berry Patch, Red River Peach Orchard and Lavender Ridge Farms, do offer something for everyone, attracting travelers by the tour bus load. Bailey’s Berry Patch offers six acres of blueberries and three acres of blackberries, which you can pick by the gallon bucket for $12. Don’t like blueberries or blackberries? Then while you are there you can grab a kulat (a cross between a plum and apricot), plums, pears, persimmons, or one or more of the other 67 products stocked at a country store on the farm, such as preserves, syrups and salsas. Stop by on any Saturday of the season for vendors, concessions and entertainment. Some of last year’s shows ranged from cowboy poets and bands, to clogging dancers and magicians. In 2008, expect an authentic chuck wagon meal with chicken-fried steak and apple cobbler. That’s June 21, and will also feature cowboy poet Lanny Joe Burnettt. Or attend the Third Annual Red, White and Blueberry Festival on July 5, to benefit the Sadler Volunteer Fire Department, or stop by for a cooking demonstration by our own Texoma Living! Executive Food Editor, Chef Cathy Zeis, on June 12. If peaches are what you crave, just 20 miles west of Bailey’s Berry Patch lies the Red River Peach Orchard. Rose and Norman Miner invite you to come and taste what Miner calls “the paradise fruit of the summer,” the peach. Pick a bunch or a few for $1.35 to $1.50 a pound, depending on the season’s crop. Miner says that a store-bought peach, which is picked probably two weeks before it reaches your hands, simply does not do the fruit justice. “It’s so much more than peaches. It’s picking that heavenly, warm, sun-ripened peach directly off the tree. Biting into it, letting its juices run down your chin as the orchard’s overall sweet peach aroma blows by just creates an entire, very pleasant country outing. While the Miners pack your peaches, enjoy a picnic, if you’ve thought to bring one, have a glass of free lemonade, and sit under the shade of a large oak. Lie back and think of the things that you can do with the peaches you picked. Eat them fresh (best within the next five to seven days), make them into jams or jellies, or freeze them for future use. For optimal frozen results, slice peaches, sprinkle with a little bit of Stay Fresh, plop them into a freezer-safe bag and use at your leisure for ice-cream toppers, cobblers, cakes, pies and more. To escape the corporate life, Jane Dane, her brother Jerry Ware, and friend Mark Whitfield, decided to bring new life to land that had been in the family for more than 150 years, and in 2004 they opened up Lavender Ridge Farms. At Lavender Ridge Farms you can pack a six-inch twist tie full of lavender shoots for $8 or cut zinnias, gomphrena, and sunflowers by the 32-ounce cupful for $9. You can take these blooms home for show, or you can learn other various ways to use your lavender by signing up for one of the farm’s annual educational workshops. Learn to cook lavender-infused pork tenderloin and mashed potatoes. Make lavender wine, crafts, perfumes and more. Photo courtesy of Bailey's Berry Patch. The Travel Industry Association of America links agritourism’s increasing popularity with findings that say tourists are traveling more by car, taking shorter, last-minute, family-friendly vacations. To get a true taste of an agritourism experience, head out in the morning, pick some breakfast at Bailey’s Berry Patch, which opens some days as early as sunrise, have lunch with lemonade at the Red River Peach orchard, and then watch the sunset and see the stars at Lavender Ridge Farms. The next time you’re planning a vacation or just a day out, think atypical, think agritourism—coming soon to a travel agent near you. Thurs-Sun 9:00 am – 5:00 pm or by appointment for star gazing, workshops, etc. Select plump, firm berries with tight skins and dark blue coloring. Purchase packaged fruit in clear containers to check the fruit on the bottom. 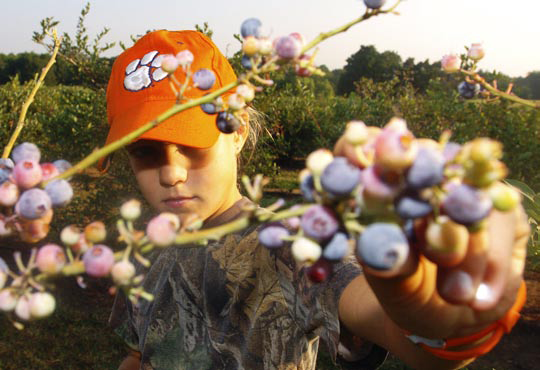 Fresh blueberries may have a dusty appearance, which means they were harvested at the best time. Avoid soft or shriveled fruit, which indicate over-ripeness. Fresh blueberries can be refrigerated for up to ten days by arranging them in a single layer on a paper towel in a covered shallow pan. Do not wash until you are ready to use. Blueberries also freeze nicely and can be used in many recipes straight from the freezer. Look for a creamy yellow background color, indicating ripeness and flavor, and a well-defined crease. Fruit that will not be consumed immediately must be refrigerated. It will keep at its best for about five days. Peaches that will be eaten in a day or two can be left out. To soften peaches, place in a paper bag for a day or so and keep out of direct sunlight. You will see a smattering of higher end plumbing fixtures at Home Depot and Lowe’s—but for the really upscale stuff you’ll have to do a little more research. Consumers motivated by big, splashy, ads in magazines and on television are becoming more interested in more unusual, more expensive plumbing in ever-expanding kitchens and baths. People are taking notice of Betty Nash’s art. Her works, done in oil, are graceful, subtle manipulations of light and shadows, of deep colors and reflections. She uses the chiaroscuro style (the play of light and shadow) embraced by masters such as Rembrandt and Raphael.